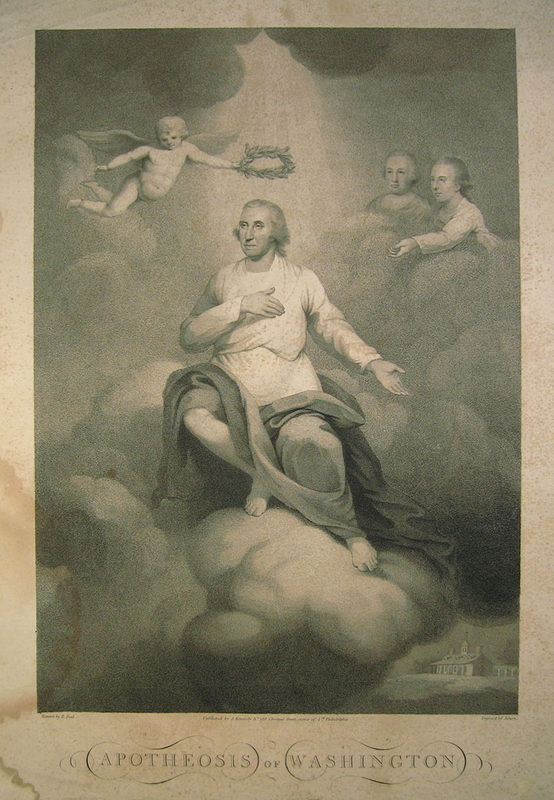 Washington's Birthday or Presidents Day: The Hagiography of Presidential Power. In 1951 during the early years of the Cold War a group began agitating for Congress to establish a "Presidents Day" to honour all the presidents as well as the office of the presidency itself, no doubt in an effort to emphasize the role of the office of the Presidency in the American republic in contrast to the recently defeated Il Duce of fascist Itlay and the Führer of Nazi Germany, as well as the powerful "Secretaries" or "Chairmen" of the communist parties of the Soviet Union and China. 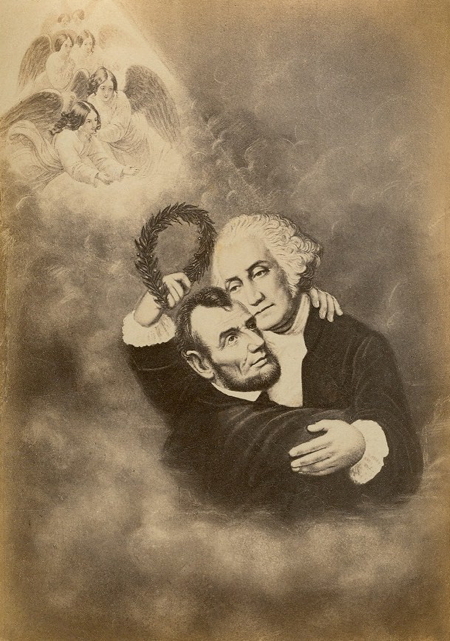 February was seen as an appropriate month because both Washington and Lincoln had their birthdays then (Lincoln on February 12) and both were regarded as crucial "fathers of the nation" - Washington for leading the military at the founding of the nation and Lincoln for using the military to forcibly maintain the union of the states in the face of seccession. 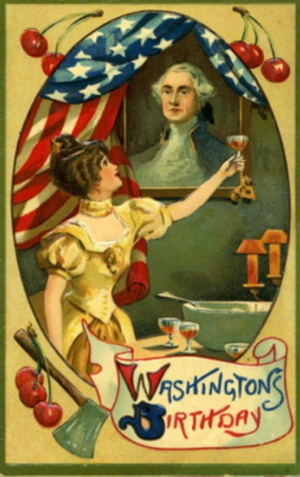 Legislation in 1968 retained the name "Washington's Birthday" for the public holiday but in popular parlance it has become known as "Presidents Day". The establishment of the day as part of a more encompassing "Uniform Monday Holiday Act" ((1971) is just one more example of how far reaching government regulation has gone in America where the Congress can now "legislate" time itself and tell citizens when to get up, when to go to work, when to go to bed and when to take a day off, with public holidays and day light saving. I have termed the process of glorification and near-worship of political leaders like Washington "hagiography" (after the centuries old Catholic tradition of creating saints out of ordinary men and women) but there are other terms which might also be used: "apotheosis" or "deification" - the elevation of someone to divine status; "regification" (my own term) - the elvation of someone to the status of a king or monarch. 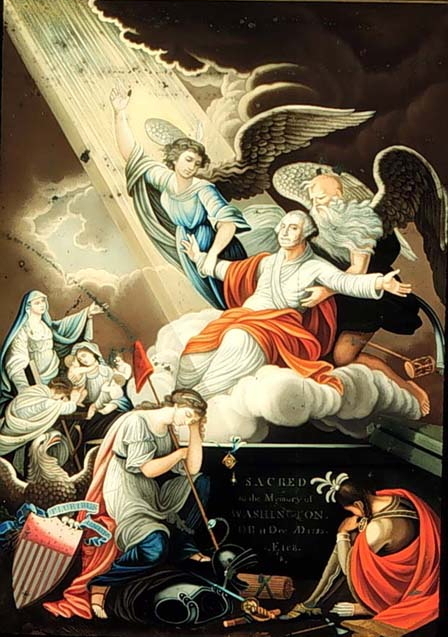 The latter, as noted above, was a fear held by Thomas Jefferson as early as 1800 when he worried about an underlying monarchie masquée within the American republic. There have been occasions in the past when the monarchie masquée has risen to the surface. During the Civil War in the 1860s, during the Great Depression and fascist era of the 1930s, and during the beginnning of the Cold War in the 1950s. 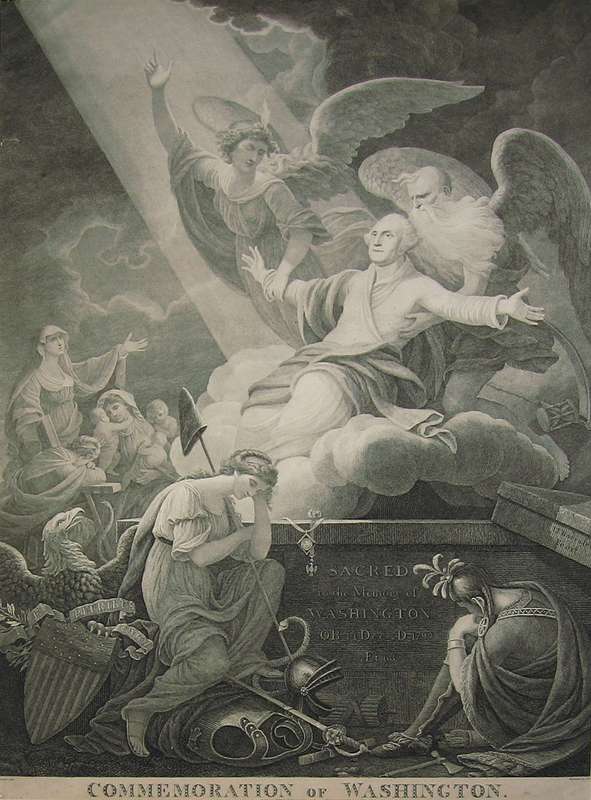 The common theme which emerges is that in times of war, economic hardship, and militarization governments seek greater legitimacy for their actions by glorifying the leader in a variety of ways, such as putting their faces on stamps, coins, and bank notes; celebrating their birthdays with national holidays, building monumental statues of their likeness, encouraging the circulation to a mass audience of postcards with suitably uplifting images, and so on. 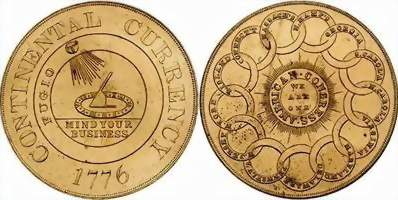 a Continental Dollar from 1776 which depicts a sun dial and a burst of sunlight on the obverse, with the slogan "Mind Your Business". On the reverse side is a series of 13 interlocking circles with the names of the 13 colonies resisting the British Empire. 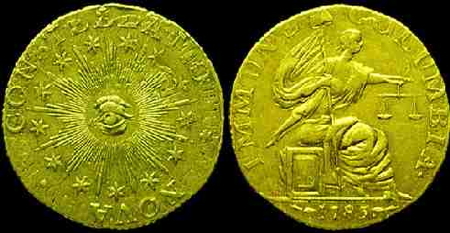 a "NovaConstellatio" (or "new Constellation" coin from 1783 with 13 new stars represnting the 13 rebellious colonies on the obverse, and a seated Liberty holding the scales on justice in her left hand and a staff with phrygian can in her right hand. a Libertas Half Cent coiin from 1793 with the head of Liberty on the obverse side, and a wreath and the "United States of America" written on the reverse side. a Liberty Silver Dollar from 1804 with the head of Liberty and 13 stars representing the 13 new states of the union on the obverse, and an American eagle clutching arrows in one claw and an olive branch in the other, with the motto "e pluribus unum" and 13 stars on the reverse. an 1896 one dollar bill showing the obverse side with the image of "History Instructing Youth" and the Washington Monument and the US Capitol Building visible in the background; to the right is an open copy of the US constitution, and around the perimeter are the names of famous Americans includiing 8 presidents (and Washington). The Goddess History instructing a youth, pointing to a panoramic vista view of the Potomac River and Washington D.C. The Washington Monument and the US Capitol Building are visible in the background. The United States Constitution is displayed to the right. Circling the motif are the last names of famous Americans. 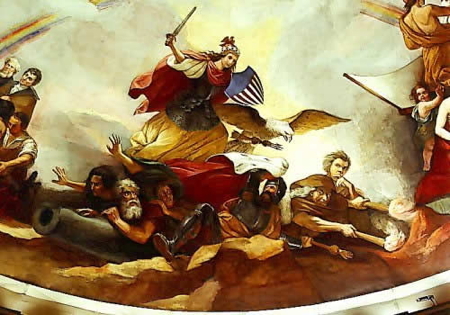 Some of those listed are: (George) Washington, (Benjamin) Franklin, (Thomas) Jefferson, (Robert) Fulton, (Samuel F.B.) 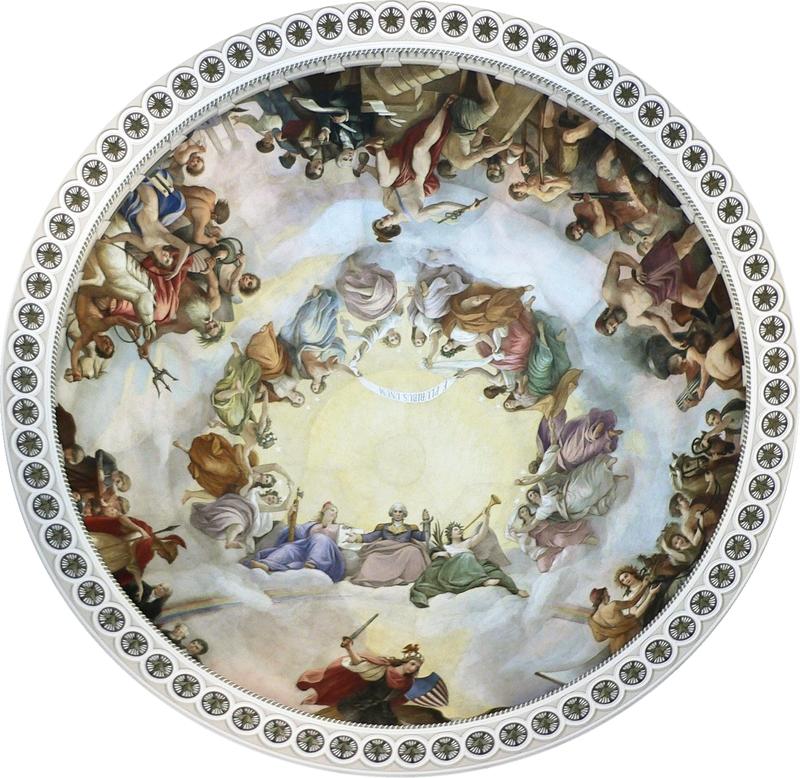 Morse, (Ulysses S.) Grant, Henry Wadsworth Longfellow, William T. Sherman, James Fennimore Cooper, Abraham Lincoln, John C. Calhoun, Washington Irving, Henry Clay, Andrew Jackson, John Adams, Alexander Hamilton, Oliver H. Perry, John Marshall, Daniel Webster, Nathaniel Hawthorne, George Bancroft, David G. Farragut, and Ralph Waldo Emerson. [See a larger version of the obverse side of the bill for more detail]. 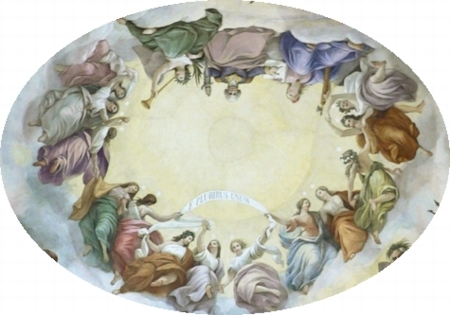 Thus eight former presidents are mentioned by name as well as the Washington Monument and the Capitol Building (which will be discussed below as its ceiling fresco contains a detailed painting explicitly called "The Apotheosis of Washington" by Brumidi), all on the one note which must be a world record until the new "Green Card" for resident aliens was issued in 2010 with micro-pictures of dozens of American presidents, incuding George Washington. 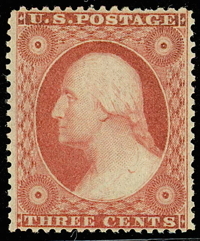 An image of George Washington appeared on one of the first stamps issued by the US Postal Service in 1847 along with Benjamin Franklin. 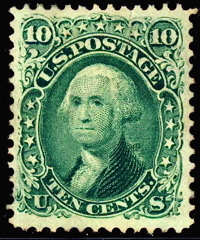 George Washington's image has appeared on more American stamps than any other president and for the first 22 years of issuing stamps the US Postal service used images of the presidents exclusively (with the notable exception of Franklin). It seems the American stamps were modeled on the British "Penny Black" stamp which appeared in 1840 with the image of Queen Victoria. This was a revolutionary idea as it was self-adhesive, pre-paid, and independent of the distance the letter travelled, but also quite traditional as it kept the image of the monarch on the stamp. 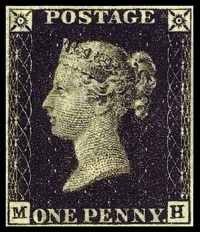 Below are images of the British 'Penny black" (with Queen Victoria's head), a 3 cent stamp issued in 1851 and a 10 cent stamp issued in 1861 during the Civil War (both with Washington's head). [Sources: Wikipedia article on "The Apotheoisis of Washington" http://en.wikipedia.org/wiki/The_Apotheosis_of_Washington> and The Architect of the Capitol website <http://www.aoc.gov/index.cfm>]. In the second half of the 19th century as a result of innovations in printing technology the price of producing images such as lithographs or postcards dropped dramatically, thus making it feasible to create a market for cheap, mass produced imagery. 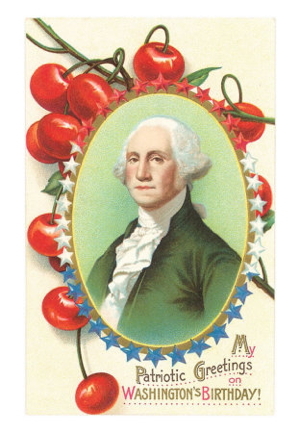 One topic for postcards which was much liked by consumers were picturesque pictures of popular travel destinations; another were pictures of much admired political leaders such as George Washington and Abraham Lincoln in America and Otto von Bismarck in the German Empire. 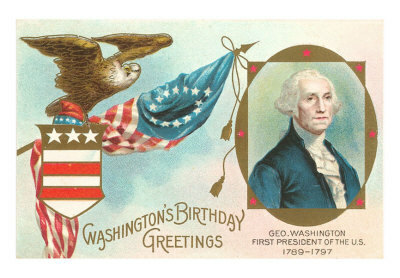 Many of these were kitsch as the following "Washington's Birthday Greeting Cards" from about 1909 show. 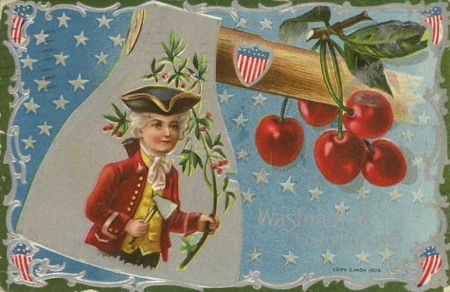 They are crudely drawn and sentimental depictions of apocryphal events in Washington's life (such as his admiting to cutting down a cherry tree) or show standard patriotic images of flags and eagles. 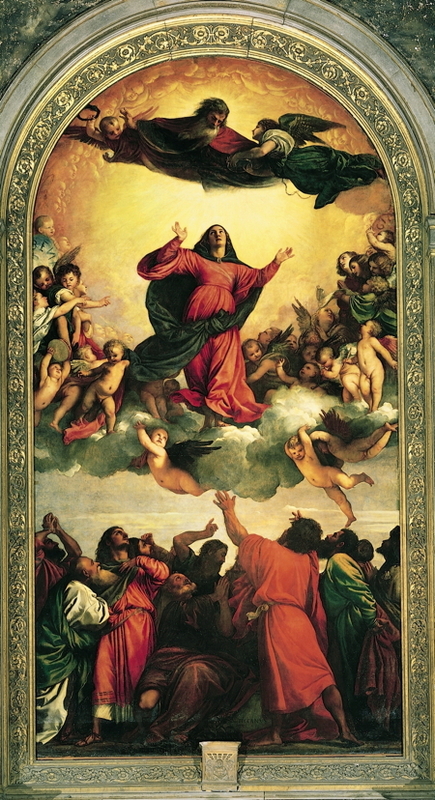 There is no reference here to his military exploits or his assumption into heaven. [Sources: a variety of non-copyright web sites].